This powerful head of Shiva, with ascetic’s locks and the third eye of yogic insight, may have belonged to a full-length image or else to a mukhalinga, the primordial phallic form of Shiva in which the face of the god projects from its side. Purchased with the assistance of Mr and Mrs Spalding and the Art Fund, 1939. The Gupta period has been considered to be the Indian classical age in so far as, in Goetz’s words, “it aspired to create a perfect unsurpassable style of life”. Its art, like that of 5th century Athens, influenced sculpture for many centuries and in lands far away from India. For the first time Indian sculpture was able to suggest higher spiritual states, a turning inward of the subject and an air of self-absorbed introspection. New too is an ability to combine the earthy and dainty, a phrase of the same author. Stella Kramrish has done full justice to one of the most impressive of all the known images of Śiva, Mahādeva or the great god. He and Viṣṇu represent the twin pinnacles of the Hindu pantheon, each with its subordinate deities and demi-gods. Whether the head belonged to a full-length figure of the god or projected from a mukha-liṅga, the primordial phallic symbol of Śiva, has not been finally decided. 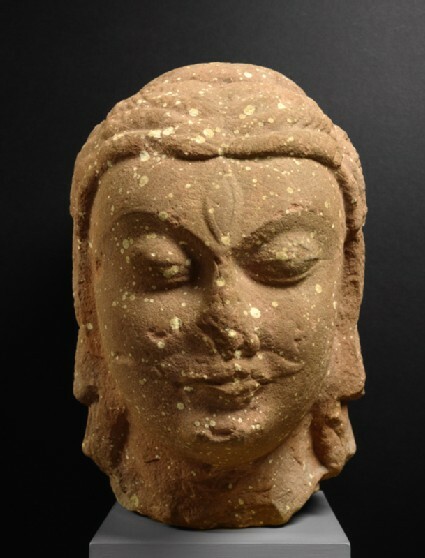 It has even been suggested that it was part of a bust, although this is an almost unknown form of sculpture in India. Nor is it certain whether the moustache was part of the original conception; if so it would point to an identification of the head with the fierce Aghora-bhairava, one of Śiva’s emanations. The way in which the matted locks of the ascetic are portrayed here, as individual ringlets, would support such an identification, although there is also a suggestion of a certain kind of wig, one of the Gupta period’s most urbane creations. The stone is the spotted red sandstone of Mathura, and the style, with its unique blend of suavity and elemental plastic power, is unmistakably that of the Gupta period in its first full maturity.